I'm watching the classic Doctor Who series, because someone wanted me to watch the new series. Or something. I've been doing it so long, I'm not sure on how it all came about. I'm up through Season 23 now. That's Colin Baker's second full season as The Doctor. It's also his last. BBC would fire him after the season ended. Before we get to all that, though, let's take a quick look at Season 23. Rumors were that BBC had canceled the series after Season 22. In fact, they moved it back to a Fall schedule for budgetary reasons. That allowed them to go an entire fiscal year without the expense of a Doctor Who season. Besides the return to the Fall, Season 23 was a little different. The format returned to 25-minute episodes, after going 45 minutes per episode the previous year. However, they didn't increase the number of episodes. During the first six seasons, there had been 40-45 episodes per season. That schedule took its toll on both William Hartnell and Patrick Traughton, who both lasted around three seasons each in the role of The Doctor. Since Season Seven, there had usually been around 25 episodes per season. That may have been why Jon Pertwee stayed for five seasons, and Tom Baker for seven. Peter Davison only left after three because he was following Patrick Traughton's example of three and done. Traughton had been The Doctor that Davison grew up watching, and was, to him, The Doctor. With the extended episodes in Season 22, the number of episodes was cut back, making the actual show content consistent with what had been the norm since Season Seven. However, when they went back to 25-minute episodes in Season 23, they left the number of episodes as the contracted number. Season 23 ran 14 episodes. Season 23 was also a single story, The Trial of a Time Lord. The trial used three stories as evidence in the trial, then added a fourth story to wrap up the trial. While the entire season was considered a single 14-episode serial, the various phases of the trial consist of stand-alone stories that could have aired outside of the framework of the trial. The Doctor was on trial for meddling. Yes, that was how the Season Six serial, The War Games ended, which concluded with a trial by Time Lords, and The Doctor being sentenced to be stranded on Earth as Jon Pertwee. The show played it up as him being tried for it again, violating our double jeopardy standard. However, all of the evidence used Colin Baker's likeness as The Doctor, so it was actually a second trial for The Doctor continuing to interfere with time and worlds in space. The second story in the trial, known as Mindwarp (4 episodes) -- although that was not officially the name of the story -- included the death of Peri (Nicola Bryant). That storyline was changed in the final story, The Ultimate Foe (2 episodes), with Peri's death being said to have been altered records. According to one report, Nicola Bryant filmed her final scene for Mindwarp thinking that her character had been killed off by having her brain removed. She was said to have been unhappy with the in-season retcon of that. Didn't stop her from taking money for appearing in officially licensed (and considered canon) audio programs years later. 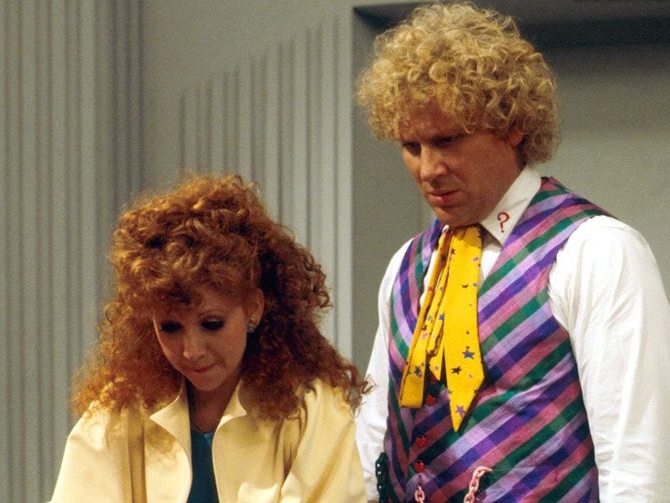 A new companion, Melanie Bush (Bonnie Langford), commonly called "Mel," was introduced with no fanfare in Terror of the Vervoids (4 episodes). It was presented as testimony from the future, after she had joined The Doctor in his travels. The trial concluded with the surprise that the prosecutor, known as The Valeyard, was actually a future incarnation of The Doctor. The Master (Anthony Ainley), who appeared in, but not as, The Ultimate Foe (2 episodes), was conspiring with The Valeyard, and called him "an amalgamation of the darker side of the Doctor's nature", adding that he came into being somewhere between The Doctor's "twelfth and final incarnations." Along with the High Council of Gallifrey, The Master and The Valeyard were covering up a massive crime by convicting The Doctor, sentencing our hero to death, with The Valeyard gaining all of The Doctor's remaining regenerations. Or something. 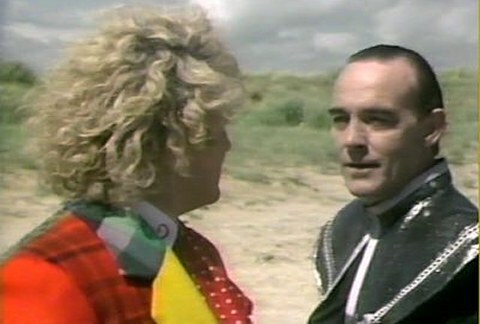 Anyway, The Master turned the tables on The Valeyard, but ended up allowing The Doctor to escape and defeat The Master. The High Council was overthrown, The Valeyard escaped, and everything went back to normal. Because of the complaints against the show for its violence, the head of BBC programming wanted to completely overhaul the show, including casting a new actor as The Doctor. None of that was known when Season 23 ended. As far as Colin Baker knew, he would be back in the TARDIS the next season. But, it was not to be. He offered to appear in the full season, with a regeneration at the end, but BBC wanted to begin with a regeneration, and offered him one serial of the next season. That would have caused him to miss other work with little return, so he declined. Let me finish the Colin Baker years by saying that I wasn't at all unhappy with his portrayal as The Doctor. However, he had the shortest run of any actor up to this time (December 1986). His character had one season to settle in before the disruption of a trial, then he was fired. I think had he remained in the role longer, he would have grown on me more. Despite the firing, Baker reprised the role in official audio plays in the years since. Oh, there is an interesting story on how they handled the regeneration from The Doctor (6.0) to The Doctor (7.0) in the next season, without Colin Baker's participation. But, we'll save that for Season 24. Is it possible Obama and Hillary imagine that they are Time Lords who can go back and alter records and storylines at will? Like the BBC, the mainstream media just air the stories without much interference. Season 23 was running on PBS here when I started dating my wife and I never really knew what was going on. Except for some random Sylvester episodes later this was the end of my Dr. Who viewing. I've read up about it since, but thanks for the summary and the inside info. Concise and clear! Looks like the guy from "The Greatest American Hero".